Pretty soon Spider-Man is going to hit the milestone 700th issue. Now with 700 candles sitting atop an all-star cake, you'd think the room would be illuminated brighter than a Dazzler vs Jubilee deathmatch. However, it seems the glitzy event is actually giving birth to the darkest of shadows, rebooting Marvel horror. Yip, at Toronto's Fan Expo Marvel stated Morbius: The Living Vampire will fly out of The Amazing Spider-Man #699.1 into his own ongoing series in January. Morbius first took a bite out of comics in The Amazing Spider-Man #101, so it is only fitting the same title gives biochemist Michael Morbius back his solo series wings. Micheal once tried to cure his own rare blood disease, in a treatment that involved the use of vampire bats. 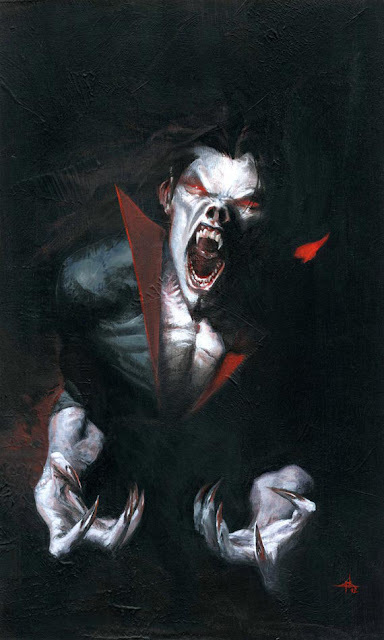 As science experiments in comics rarely succeed, Morbius was turned into a vampire like being, who accidentally murdered his true love soon after his horrifying transformation. 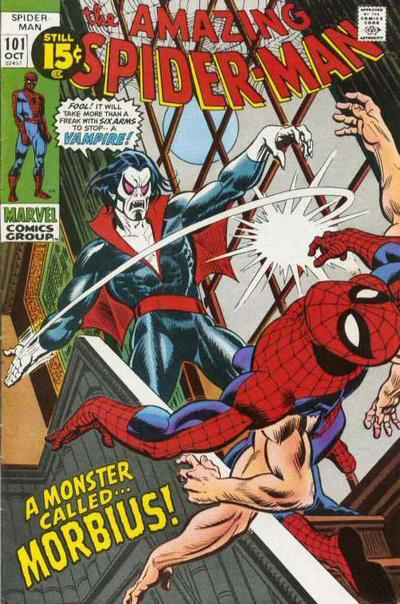 Spending the 90's as a star of Marvel's darkened 'Midnight Sons' range of books, Morbius has recently been helping Spidey in defeating the Lizard's latest schemes, while trying to find a cure for his bloodlust at the same time. on man that painting is epic! not only is it excellently painted with a great use of light and shadow the imperfections on the surface area makes it look like something you'd see in a modern art museum. Robert, I'll definitely be picking up the first few issues right there with you. It's odd, I've been thinking for a while now of steering IADW towards characters that aren't in the front row more and then this happened. Kinda an omen if you ask me. Dave, that painting really does look like some kind of oil canvas doesn't it? I wonder if it actually is, or just a digital work done to look like one. Epic either way. Dale- I think Midnight Sons would be a great shot that Marvel NOW! really is knocking on different doors to the same old ones usually shoved in front of fans faces. I mean nothing is wrong with Hulk, Thor or the likes by any means, but lets dig a little deeper with this big event I reckon. What do you think? Definitely. If Marvel wants to match DC's reboot, which they are, then be truly diverse like DC with the darker edge titles, and commit not to just to the cosmic and the mainstream MU, but the horror department too. Some people like vanilla, some like chocolate, but all like the option of variety. Okay but if we see Neopolitan #1, monthly from Marvel, somecsuckers gonna owe you and I a royalty my friend. I thought he would became a thunderbolt, when Spider-man put him on the Raft. I this is even better! It sure is Aliera. Marvels about to show the world what really goes bump in the night!